Last minute cheap holiday and as the saying goes you get what you pay for, on arrival opened the door to immense heat and musty smell, no air con but fans could be hired along with remotes for TV. The apartment was old and not the cleanest, however, the pool area was clean and tidy. On departure we were given another room to stay in which was full of mites and dead cockroaches, I would not go back even if it was free of charge and this should be rated as a 2 star. I stayed at Oasis Mango Apartments earlier this year with my boyfriend, his sister and her boyfriend. My boyfriend's sister booked the resort through Aronasol, a company I had never heard of. She also admitted she booked this resort simply because she liked the name so I was a bit worried but pleasantly surprised when we arrived. We stayed in a 2 bedroom apartment which was clean and had lots of room for both couples, we could spend time as a 4 but also have some quality time together with our partners. The apartments were within walking distance to the main town where there was a good selection of restaurants and shops. Both the bar and restaurant in the apartment complex were reasonably priced and the pool area was a decent size and we always managed to get sunbeds. My boyfriend's sister and her partner hired bicycles and went out on them one day which they enjoyed, hwever me and my boyfriend are lazy and preferred to lounge around the pool most of the day. My family and I have just come back from this hotel well what can I say, I would 100% definitely go back. It was clean, the food was fantastic, the staff where brilliant the pool was warm plenty of sun loungers, yeah the hill was steep but its inspired me to get fit! We all had a good holiday. 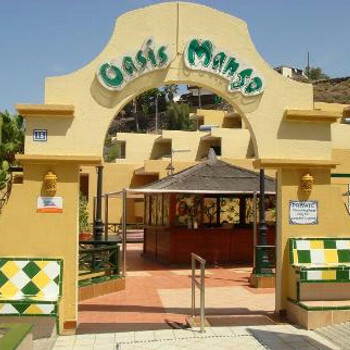 Well done oasis mango you made our holidays great. Very clean spacious apartment. Clean towels every day, linen changed twice. Breakfast buffet style. Good enough, but very repetitive, ie hot food consisted of boiled eggs, scrambled eggs and bacon: every day. Saying that, plenty of fruit, rolls, cereal, juice and the usual continental selection. Staff very pleasant and helpful. Spotless pool area but the water is very cold. Lifeguard on duty all day. The kiddies' paddling pool is like iced water. The hill approaching the complex is not for the less able bodied, shall we say. Its ok walking down to the beach (about 20 minutes), but walking back after a long day out is tiring (about 40 minutes), especially if you have fractious kids with you. If you are a young(ish), healthy adult it would be no problem. However, you can always get a taxi back up (about 3 euros). Lovely views from the apartments though. Chose this apartment the day before travel on the strength of the positive reviews. First time I've used this company but they was very accommodating in making a stress free change from our original apartment choice. Nice,clean, spacious apartments but I guess the lack of wardrobe and drawer space would be an issue if a family stayed. There were lots of steps to negotiate to our apartment and coupled with the hill down to the resort, I wouldn't recommend these apartments to the less able bodied or disabled. These apartments are definitely some of the best throughout los cristianos, they were very spacious and clean throughout. We travelled in may and the weather was very hot, most days it reached about 35 deg. The only two disadvantages with these apartments are that they do not have air conditioning and they are up quite a steep hill (but if you are OK with walking about 20-25 min into the main area then this will not be a problem). I would definitely not recommend these apartments to anybody with walking difficulties. The advantages definitely out-weigh the above, the rooms are very nice and modern with lots of space in all rooms. Some of the apartments have lovely views, we were allocated a room on the fourth block that over looked the sea. The area around the apartments have some very nice restaurants just a little walk down the road, must mention Taylor's lounge very nice bar and food. I would definitely return to these apartments if I was to return back to Tenerife. Arrived boxing day. Apartment immaculate, clean, modern spacious, recently renovated. Pool area spotless, heated pool, baby pool, pool bar serving snacks. Apartments situated top of hill but we found the walk to the beach OK, 10-15 Min's. Would recommend these apartments to families, nice relaxing base. Entertainment minutes away 6 yr old daughter wants to book again she enjoyed it that much. Decided to go away with our 2 year old for New Year. Booked last minute and really cheap. Had no expectations. Apartments were fabulous, large, well-equipt, clean. Have not stayed in a larger apartment. Tip ask to stay in an even unmbered room as they are higher up and have better views. Shop was well stocked and the bar served great drinks and snacks. Only fault was the amount of chain smoking Brits around the bar - why can't they put out their dirty habit in ashtray - key in the name ASH trays, its where you put your ash, not flicking on the floor or in the pool. Rant over - that was only fault. Huge spar shop just down the road and a really good Indian restaurant too. All in all a prefect little oasis for a sunny Christmas break - fabulous view of the fireworks on New Year's Eve too. Arrived home today, fantastic holiday. Oasis Mango was a lovely hotel, a very attractive hotel and very clean. Our apartment was spacious and cleaned twice in our 7 night stay, the staff were very friendly, and helpful. They had a good selection of food on their menu.